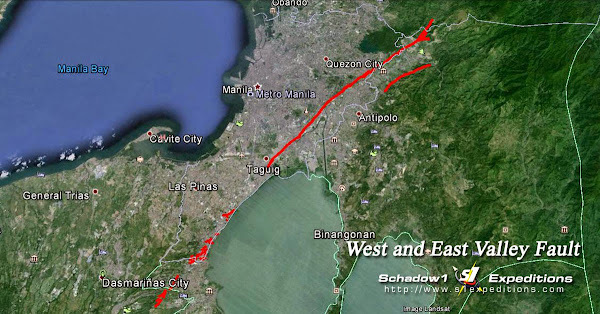 The West and East Valley Fault System span from Angat, Bulacan all the way down to Carmona, Cavite and Calamba, Laguna and is the most feared event that could hit Metro Manila in case the fault system moves as it may cause larger than 7.0 magnitude earthquake. As of the meantime, disaster resiliency assessors have been saying that the country is not prepared for a calamity such as this. Schadow1 Expeditions has acquired the fault line data from PHIVOLCS and traced it on top of OpenStreetMap and Google Earth. We have recently acquired the fault line data for the West and East Valley Fault System from PHIVOLCS and have decided to trace the data on top of OpenStreetMap Philippines and on Google Earth. This is to provide a graphical representation of the exact infrastructures that lies on top of the fault line so that everyone will be aware of the dangers and prepare for the future. 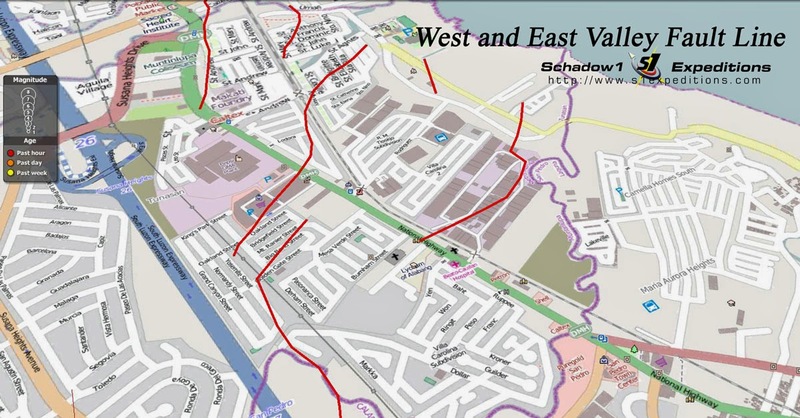 The photo above is a snapshot along the area of Muntinlupa and San Pedro, Laguna where the red line is a part of the West Valley Fault Line. The fault line starts at Montalban Landfill of Montalban Rizal and ends at San Lazaro Leisure Park and Casino at Carmona, Cavite. Although, recent studies of PHIVOLCS shows it still extends from Carmona to Silang and to Calamba, Laguna. We are still waiting for the precise data so we can add the fault line's extension at the interactive map. As of October 2, 2014, we have acquired the additional data and extended the fault line until Calamba, Laguna. These are the following notable barangays, villages, and infrastructure that lie exactly on top or within a 500-meter radius from the fault line. May tinatayo nang high near Ever Commonwealth so immediate danger from the line sa Batasan Hills tama ba? Two projects underway in fact. Di ako sure sa target number of floors nila pero nakakalagpas na sampu. Wala bang building code violations dito? Specifically where in batasan hills? What about filinvest calamba laguna project? Almost 4 or 5 barangay's ang nasakop nila i think.maraming villages sa loob ng calamba de ciudad. Have not included it on the list as its nearest feature to the West Valley Fault is about 5.48 kilometers away. It is only as accurate as how PHIVOLCS plotted it on its overlay map. Possibly 5-10 meters accuracy as per optical recognition through trace. Bagong silang north caloocan maaapektuhan din po ba or mkksama din dyan sa west valley fault line? Na-check mo na ba yung downloadable interactive map? Sa nakikita ko, 10.4km away ang bagong silang sa pinakamalapit na fault line. Maapektuhan? Kapag magkalindol, maaari. Pero direktang maaapektuhan, hindi. Saan ang saktong lugar sa carmona estates tatama?? Im from carmona estates.. thats so scary. Apologies as the server housing the interactive map was down due to excessive traffic. I have added mirrors so it can be downloaded elsewhere. Increase awareness is what we can do to save lives and minimize damage as we cannot stop mother nature. Updating the information here especially on areas that will be affected will help. I'm sharing this. How about certain subdivisions in Antipolo like Havila, Maia Alta and iba pang magkakalapit na subdivisions dito? Tatamaan po ba ng fault line? I think its too far n! Ateneo, barangka and sta. Elena ang nearest place s binanggit mo so napakalayo n s antipolo. You cant just pray you idiot, and you have no right to tell people to just sit and do nothing but pray. Its better to be prepared. kulang lang tayo sa mga job opportunities dito sa Pinas, kaya nga mga nag aabroad ang karamihan sa ating mga kababayan eh! HI, listed among your list is Rizal, are we talking about the whole town here being on top of the fault line? Can you provide specific bgys or villages just like the others? Thanks! I believe the Rizal in the list is Barangay Rizal in Makati just south of Barangay Aguho in Pateros as there are more specific areas in the province of Rizal listed before it. Prayers always, nothing is impossible with God. Malapit ba sa colina homes nang camellia sa San Pedro Laguna ang mga fault line nang San Pedro? Kakabili Lang namen na bahay don..
hi, dito kami fti tenement part of taguig. matatamaan po ba kami ng posible lindol dahil kasama ang taguig sa red line? need naba lumikas dito? malapit kami sa arca south known as fti. your answer is much appreciated. thank you. yes. tenement is under very soft rock. it will sink in the event of 7+ movement. kasama ba ang fti tenement? sa taguig? Kasama po ang rizal, ibig sabhin po ba lahat ng brgy. sa rizal kasama sa fault line or kahit malapit na brgay??? Katulad po ng barangay sta. Ana pateros, malapit po yan sa aguho kasama sa danger zone po ba Brgy. Sta. Ana? hi po, nakalagay po sa list ang rizal, ibig sabihin po ba nuon ay lahat ng barangay sa rizal ay kasama sa fault line o malapit sa fault line at nasa most danger zone. Kasi po alam ko aguho ay sa pateros at karatig barangay din nito ay barangay sta. Ana pateros. Sana po masagot. Salamat. What about Sta. Rosa po? Madadaanan po ba? Kasama po ba ang tenement sa punta sta.ana Manila?at Kailan po ba mangyayari ang Lindol? ask lang po qung kasama po ang cainta rizal sa matatamaan ng fault line? taga rito po kase kami, just worried for my daughter kase palagi kame sa work ng asawa ko, and shes w/ my mama? Hi. Is Vist Real Classica included sa fault line? Thats near Filinvest homes sa commonwealth. Coz we bought a Lot there and planned to build a house. And may i ask po is Ateneo de Manila along katipunan is in a very high risk danger zone? Coz my sons will be studying there. Am worried for my kids coz am a working mom and i leave my sons to the yayas only. Thank you! Prayers...I just hope that government can do contingency plans. Those outside the fault line should be ready to help. Good pm po.Kasama po ba ang Colinas Verdes San Jose del Monte Bulacan sa fault line? Colinas Verdes is about 6km from the Fault Line. KASAMA PO BA ANG GENERAL TRIAS CAVITE SA FAULT LINE? Tatamaan po ba sakali man magkalindol ang Eastwood Subdivision sa Rodrigues Rizal Montalban? Kasama libis dami pa naman call center dun. Lets pray and be prepared. Kasama rin po ba ang imus at dasma cavite sa fault line? Gud pm po kasama po ba ang saimsim calamba laguna sa tatamaan taga acacia park homes po kmi worried po kmi pls reply po.. Admittedly, nakakatakot isipin ang magiging pangyayari but, as the saying goes, to be forwarned is to be forearmed. So, I might as well ask this - how about po ang BCDA Diego Silang Village? How devastating (for lack of a better/nicer word) will be it for us who live there? Thanks. God bless all of us. Kasamampo ba ang sampaloc manila sa fault line? Kasama ba sa west fault line ang san isidro and san rafael sa montalban rizal? Specifically eastwindhomes subd? One can just use Google Earth to measure distances from the fault line to the location of choice, given that the fault line layer is uploaded. The assumption is if the epicenter is shallow enough, if you are nearer the fault line, the more damage you experience, but many things can still happen. If we look closely on the details of the Atlas it covers most of Mega Manila including down Laguna and Cavite areas. No wonder why there are so many "rent-to-own" "for as low as" promotions around. Land owners know these facts so they must dispose their lands as fast and profitable as possible. Let us not forget that the most devastating natural calamity is an earthquake, with regards to the most number of lives lost. There are no such thing as "100% earthquake proof" building or construction, although it may help to retrofit. This is a sad reality that people are into profit than safety. In my opinion and as i have compared other maps from Phivolcs and Nababaha.com Safest areas would be New Manila, San Juan, Camanava-Obando, Meycuayan, Marilao. The dilemma is when we go east it's landslide and faultlines. If we go west it floods. Opinions differ, I opt to expeience flooding ( we can raise our houses and float in flood) than experience an earthquake and watch everything fall down apart. Hard earned money and lives at stake. Flood subsides, earthquake stops. Praying for the safety of everyone, Let's make better choices. Kasama po b ang bulacan ano2 pong part? Then, may ipapalabas pa na movie, yun San Andreas. Mas lalong mag cause ng pagpanic yan sa mga filipino, magiging blockbuster yang movie dahil maraming manonood dahil sensational na naman ang topic na earthquake ngayon. we never expected this fault line to extend this far. is there a safe distance from the fault line that we can consider safe? if ever my house lies along the fault line will my house be damaged? I never thought the fault line will reach even cavite area and maybe up to laguna. be safe everyone! What type of quake motion are you concluding? Up/down or side ways. We are almost to conclude a lot purchase in Vista Real Classica 2. Will this area be in the 500 radius? Maapektuhan po ba buong pilipinas?maapektuan po ba yubg ibang lugar ?? After masinag antipolo lng po kmi s crestview subd.ttamaan po ba ng fault line ung lugar nmin?